Bentley Engine Start Stop Button Sticker. 16mm. A Bentley Engine, Stop Start sticker. Robustly printed in White on Black. Machine cut to circular shape. Sticker measures 16mm diameter and fits over the button on Continental GT's etc. when the original has been damaged / worn away. Stickers are cut to shape, the white square that you see us backing paper. Rudge Whitworth Coventry Wire Wheel Stickers. Set of 4. 25mm. Golden Lodge Spark Plugs Chequered Oval Stickers. 5.5" Pair. Rudge Whitworth Coventry Wire Wheel Black Detail Stickers. Set of 4. 28mm. Trico Solvent Washer Bottle Bracket Shaped Sticker. 4". Rudge Whitworth Milano Wire Wheel Stickers. Set of 4. 25mm. Rudge Whitworth Coventry Wire Wheel Double Line Stickers. Set of 4. 25mm. 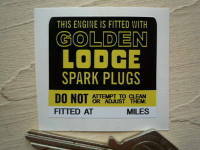 Golden Lodge Engine Fitted Sticker. 1.75". Robergel Wire Wheel Rim Detail Stickers. Set of 4. 30mm. 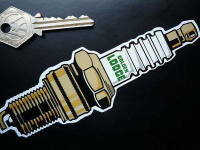 Golden Lodge Spark Plug Sticker. 6". Bentley Flag & Scroll Sticker. 4". 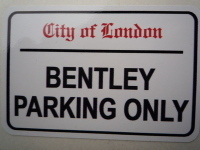 Bentley Parking Only. London Street Sign Style Sticker. 3", 6" or 12". Golden Lodge Yellow & Black Oblong Stickers. 4" Pair. Bentley Tyre Pressure Stickers. 1.75" Pair.